I developed the system architecture, carefully analyzed the consumables problem, designed and printed thousands of books. 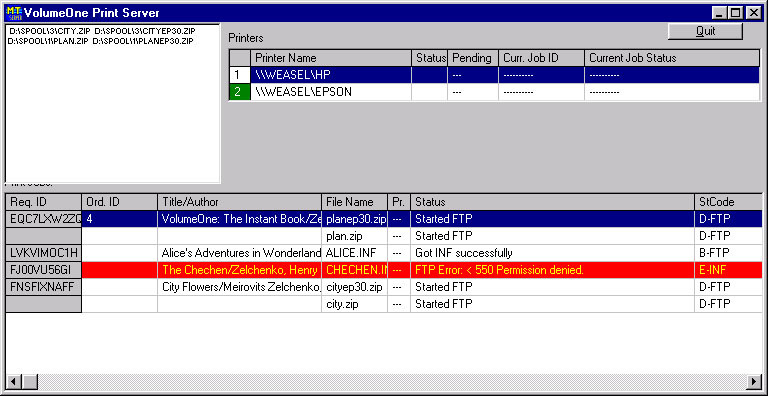 I even built the most cost-effective book printing platform ever made, running under $15,000. (Our next most economical competitor was in the $70,000 range.) I even wrote the network patent that Harvey Ross — known as the father of book-on-demand printing — became my partner in, not long before his death. For several years, VolumeOne was in nearly all North American investment discussions as the top candidates for our technology plan. We often were in constant contact with people from Jason Epstein's 3BillionBooks (now On Demand Books, makers of the Espresso Book Machine); Xerox; Elibron; University of Virginia, and other investors. 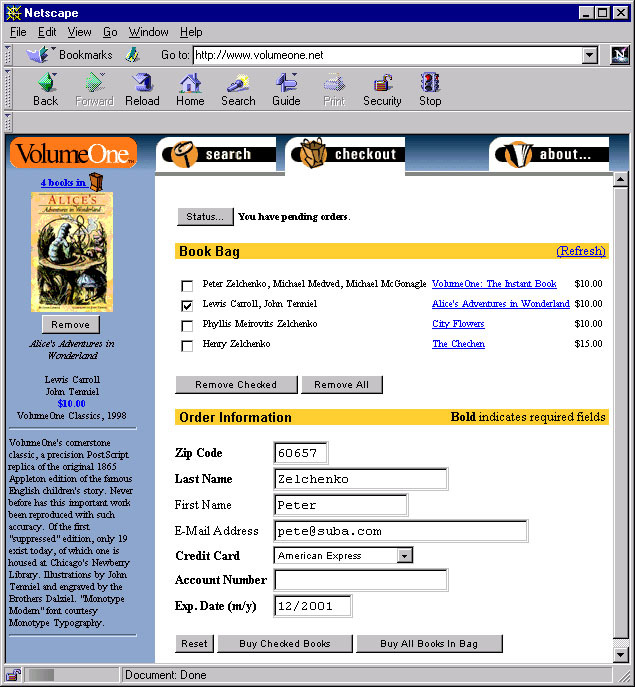 Above: This ultra-fast, easy-to-navigate front end was designed by Peter Zelchenko and programmed by Peter, Mike Medved, and Mike McGonagle. Above: Behind this multithreaded print spooler (which Medved and I co-wrote) was a massive amount of code. Behind it we built a very lean, multithreaded central application server in Delphi designed to handle tens of thousands of customer orders per minute to thousands of these print systems. The spoolers were distributed and would handle book downloading to the store where they were located. And I wrote a fully hands-free PDF-based imposer, in C and using the Acrobat PDF Library. So, multiple books are ordered, directed, downloaded, imposed and printed without anyone lifting a finger. In my world, I would manually bind the book to the cover. In Harvey Ross's and Jeff Marsh's world (Espresso BookMachine), the cover was in addition automatically bound to the book — an engineering proposition that I am afraid is still too costly and unworkable. 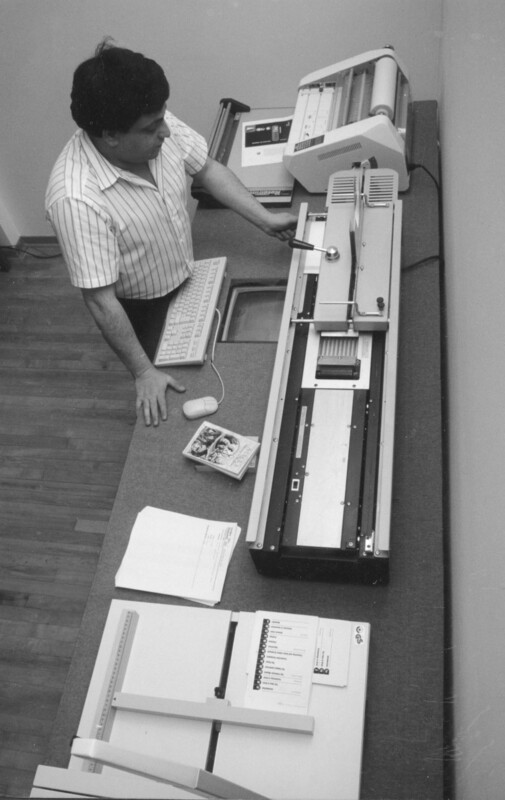 Above: Programmer Mike Medved binding a book that just printed on my $15,000 platform. The spooler window can be seen built into the table above the keyboard.